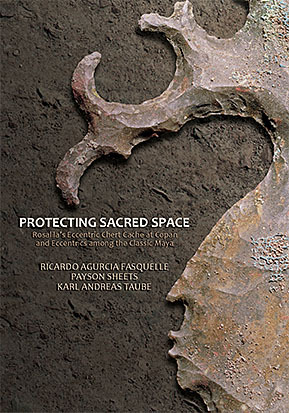 Precolumbia Mesoweb Press presents Protecting Sacred Space: Rosalila's Eccentric Chert Cache at Copan and Eccentrics among the Classic Maya, by Ricardo Agurcia Fasquelle, Payson Sheets, and Karl Andreas Taube. Monograph 2. Precolumbia Mesoweb Press, San Francisco. Paperback, 152 pages, fully illustrated in color. "Eccentric flints" have been the focus of research among Maya scholars for close to a century. Unfortunately, most elaborate eccentrics in museums and private collections were looted and thus are lacking in information about their archaeological context and dating. Therefore most remain as intricately elaborate, enigmatic artifacts, with their meaning, iconography, and objectives of manufacture and placement forever hidden from scholarship. This study focuses on a cache of nine eccentrics and three bifaces placed within the Rosalila structure at Copan, Honduras, and excavated by Ricardo Agurcia Fasquelle in 1990. The nine are the largest and most elaborate set of eccentrics ever excavated in the Maya area, and because they required extraordinary skill, indicting their unusual importance, their manufacture is considered here in detail. Because the cache was carefully excavated, it presents an unusual interpretive opportunity.